You can hardly say he departs ‘trailing clouds of glory’ to quote a phrase from Wordsworth’s Intimations of Immortality. Not when senior figures in his party have been briefing against him for months and the clouds swirling around him are unanswered questions about Nama, and about his political judgment in the last few months such as rotating ministers or the appointment as a junior minister, someone who had no votes and had never even spoken in the assembly. 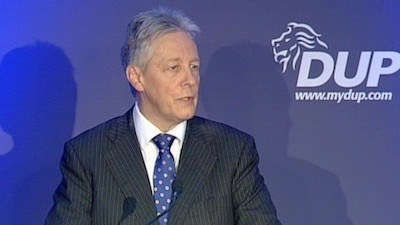 ‘Disbelief’ was the most charitable reaction in the DUP. It’s not the way it used to be. Revered as the cold, master tactician Robinson built up the DUP from a bunch of outsiders in the 1970s, mainly members of Paisley’s fanatical religious sect to become the dominant voice in unionism in 2005. Robinson’s mastery of proportional representation was legendary. He devised the slogan ‘Vote 1, 2, 3 DUP’. It meant even candidates with a tiny first preference vote were swept in by transfers from the enormous vote of the main candidate. It also suited the malignant megalomania of Paisley who couldn’t understand the advantages of splitting up a constituency for maximum advantage. What talent Robinson had in tactics was compensated for by its absence in strategy. He was great at wheezes, mostly to placate Paisley whom he kept sweet for twenty-seven years as his dutiful bag carrier. The nearest he came to throwing up his head was in 1987 when he resigned as deputy leader to participate in the Unionist Task Force to try to navigate a new route for unionism. However, the brains behind that abortive strategy belonged to the UUP’s Frank Millar. It all came to nothing and Robinson slunk back to Paisley’s side. Robinson himself was never able to devise a long term vision for unionism. His politics were short term advantage. He is a bean counter rather than a strategist: a classic number two. Charmless, ruthless, petulant, contemptuous when challenged at press conferences, there has to be some sympathy for Robinson having to put up with and defend the nonsense Paisley spouted for years. Then after Paisley’s departure he has had to contend with the Paisleyites in the party, Free Presbyterians first and politicians second. They never forgave him for ousting Paisley. To Robinsons’ discredit he never stood against the wilder elements in the party and at times even sought to lead them. His most publicly disgraceful behaviour was leading a mob into the village of Clontibret in 1986 which led to his conviction but influenced who knows how many gullible eejits in unionism who subsequently ended up in jail. His strategic judgment never improved. The flag protests which racked the greater Belfast district in 2013 were all about the DUP winning back East Belfast from Alliance. While Martin McGuinness showed courageous leadership in condemning dissident republican violence as ‘criminal’ and ‘traitorous’, Robinson could never bring himself to condemn unequivocally the flag protests never mind the UVF and UDA whom he once described as ‘counter-terrorists’. He never gave the impression that his heart was in the Stormont executive of which he is First Minister. Do you remember him ever uttering the words ‘power-sharing’ approvingly? He never denied Martin McGuinness’s assertion that the DUP were in the executive not because they want to be, but because they have to be. In the end Robinson has gone before he was pushed. His opponents in the party have made no secret of their belief that he is now an electoral liability. If he had adopted a warmer more whole-hearted approach to sharing power with Sinn Fein in the last five years it could have encouraged DUP MLAs to abandon their arms length attitude but he’s not that kind of man.